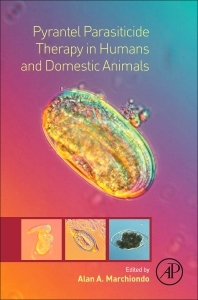 Pyrantel Parasiticide Therapy in Humans and Domestic Animals presents a single source history and reference on the parasiticide activity and pharmacology of the tetrahydropyrimidines and their salts in humans and domestic animals, also collating evidence that resistance to pyrantel has developed in human and domestic animal nematodes. Other books of this nature have been compiled historically for specific anthelmintic compounds, but none has been written to date for the pyrantel family of drugs. Pyrantel, a nicotinic receptor agonist, has been used in domestic animal and human medicine since the 1970’s to control two important nematode groups, the hookworms and the roundworms. Given the zoonotic potential of these parasites, pyrantel has served a dual role in helping to protect the health of both domestic animals and the public for more than 45 years. Academic and industrial parasitologists: graduate students, faculty, teachers, and researchers. Veterinarians: graduate students, faculty, teachers, researchers, and clinicians. Medical Doctors: graduate students, faculty, teachers, researchers, clinicians. Pharmacologists, Medicinal Chemists, Toxicologists, Molecular Biologists, Cell Biologists, Public Health Workers, and Government Agencies.